Explanation: Bright, hot, supergiant star Deneb lies at top center in this gorgeous skyscape. 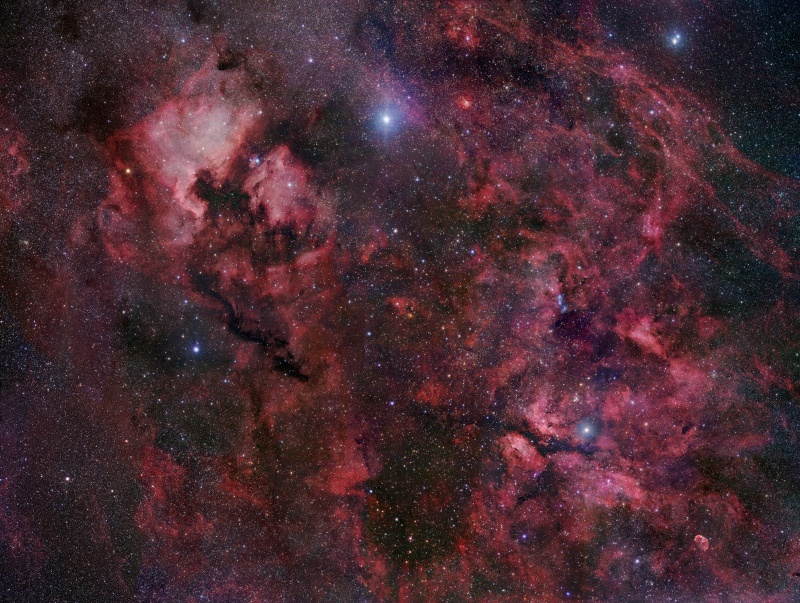 The 20 frame mosaic spans an impressive 12 degrees across the northern end of Cygnus the Swan. Crowded with stars and luminous gas clouds along the plane of our Milky Way Galaxy, Cygnus is also home to the dark, obscuring Northern Coal Sack Nebula, extending from Deneb toward the bottom center of the view. The reddish glow of NGC 7000, the North America Nebula, and IC 5070, the Pelican Nebula, are at the upper left, but many other nebulae and star clusters are identifiable throughout the wide field. Of course, Deneb itself is the alpha star of Cygnus and is also known to northern hemisphere skygazers for its place in two asterisms -- marking the top of the Northern Cross and a vertex of the Summer Triangle.